December | 2009 | Great Auk - or Greatest Auk? It’s that time – the number is big and round, and we’re making top ten lists! Because I am totally susceptible to peer pressure, here are my top ten birds of the decade – the latter part of the decade is more heavily represented than the start, because I stepped up my game both birding-wise and in notetaking as time went on. This bird, so brown and basic and in the middle of so much nowhere, had a formative influence on the Inimitable Todd’s attitude towards birding, and it took many years and some amazing owls to convince him that I wasn’t completely crazy for delving into this hobby. I, on the other hand, was thrilled; it was my most difficult id to date (although greatly aided by the fact that the bird had been previously identified by others). Since the Meadowlark was singing and defending territory, it made an appearance in the new Breeding Bird Atlas for New York, which I just so happened to get for Christmas this year. 2. Anhinga, Tarpon Springs, December 2002: Todd’s skepticism about birding does not extend to larger birds. My skepticism about Florida doesn’t extend to the avifauna. Snakebird sums up the result of this faith and hope. 3. Little Auk, off Islay, Scotland, August 2005: My birding life and writing life collided for the first time in Scotland. I’d traveled to Glasgow for Worldcon (it seemed like a good idea at the time) and afterward The Inimitable Todd and I took a side jaunt to Islay before returning to the States. I added a number of cool birds to my lifelist on this trip, including White Wagtail and Eurasian Oystercatcher. But the high moment occurred when I looked off the side of the ferry and saw a Little Auk (aka Dovkie) in the choppy sea. This was my first alcid (though I had already been obsessed with Great Auks for years), and it was immediately burned into my synapses, to emerge later in strange and mysterious ways. 4. Black Phoebe, San Francisco, May 2006: Another bird that summed up a trip full of many great birds (and non-birdy good times). On the first day of my first trip to California I spotted these jaunty, bold birds hopping from tree to lawn and back again in the park. I continued to spot them daily on a trip that also brought me Western Grebe, Black Oystercatcher, Black-necked Stilt, Anna’s Hummingbird, Oregon Dark-eyed Junco, and (post-Alanis ironically) my life Brown Creeper. They became my inner symbol of California. 5. Western M!^&*&%$@^%^#g Reef-Heron, Brooklyn, July and August 2007: The bird I never saw inspired two Livejournal posts that later became the rootstock for this blog, and eventually my MFA portfolio. None of the other birds I haven’t seen, and there are many, ever did as much for me. 6. Northern Lapwing, Chew Reservoir, England, July, 2008: There are certain birds that I’ve always stared at in the field guide and coveted, and Northern Lapwing is one such species. When I met Charlie from 1000birds.com on my second trip to Great Britain, I mentioned this, and Charlie – a superb and dedicated guide – got it for me, along with Shelduck, Hobby, Common Kingfisher, and a lot of other really great birds. 7. Burrowing Owl, Cape Coral, November, 2008: After so many years of Inimitable Todd tolerantly grinning at my birding escapades in the wake of the Western Meadowlark Incident, he was bitten hard by the owling bug and showing him these big-eyed popup creatures sealed the deal. Except, of course, that he technically showed them to me… Coming on the same day that I saw the Florida Scrub Jay, this experience was even better. 8. Harlequin Duck, Long Island, March 2009: Another bird that earned covetous stares in the field guide since I was old enough to read is the Harlequin Duck. A trip to Long Island with fellow bird-bloggers Corey, Patrick, and John let me see them at last. And though the traditional method of seeing sea ducks is to squint through a scope at them, these came and frolicked virtually around our feet. Good times. 9. Black-footed Albatross et al, Pacific Ocean off Southern California, September 2009: I went into my epic and long-awaited pelagic trip wanting to see an albatross. And I saw an albatross… and so much more. 10. Brown-headed Nuthatch, Charlotte NC, December 2009: I started the decade by adding a small brown and yellow bird to my life list, and I ended the decade by adding a small gray and brown bird to my life list. And tomorrow I get to wake up and start a new year list, again! It’s a good life. Once upon a time, there was a river. It flowed from the Blue Ridge Mountains to the Wateree River, which flowed to the Santee River, which flowed to the sea. A people known as the Catawba lived along its banks, and after assorted Europeans came and killed, infected, evicted, or otherwise displaced them, the river continued to bear their name. In 2008, the Catawba, with the Wateree, was named the most endangered river in America. One reason for this designation is the Cowans Ford Dam, a hydroelectric dam that created, among other things, Lake Norman, by backing up the river into the valleys that surrounded it. And Lake Norman created lakefront property, and lakefront property creates a near-unstiflable urge in certain people to build hideous “communities” full of overly large houses, golf courses, boat slips, designer dogs, and people who were born on second base, stole third, and still think they hit a home run. Christmas, of course, is a time for family. In this case, the Inimitable Todd’s family. Which means Lake Norman. Some 45 minutes from the artifice of the lake is the somewhat more noble artifice of the McDowell Nature Preserve, where a project is underway to restore a fragment of the native prairie. McDowell also has several miles of hiking trails that encompass creeks, lowlands, cedar forests, and bits of the equally artificial Lake Wylie. I was hoping it might also have Brown-headed Nuthatches. 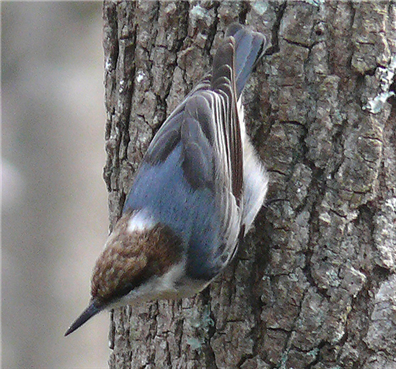 But Brown-headed Nuthatches are among the many birds that have declined due to fire suppression, keeping such elite company in that regard as the Red-cockaded Woodpecker, Florida Scrub Jay, and Kirtland’s Warbler. They like mature, open pine forests, and apparently McDowell Nature Preserve did not fit their bill. It was too dense, perhaps, or the cedars not appealing. It was a lovely preserve for all that – full of easy trails, soft earth, and flocks of traditional winter birds of the southeast U.S. – Carolina Chickadees, Tufted Titmice, Yellow-rumped Warblers, Cedar Waxwings, both kinds of Kinglets. Brown Creepers throwing me into a false alarm every time they hitched along a limb. Red-bellied Woodpeckers and Cardinals. Two days later, with Christmas hanging tattered in our past and a flight back to JFK in our very near future, I was walking the streets around Lake Norman with the Inimitable Todd . I knew I was bound to find some last-minute goodies here – mix of wooded and lawn/golf course habitat had previously been productive for Eastern Bluebirds, the occasional Loggerhead Shrike, and of course more Chickadees, Titmice, and Yellow-rumped Warblers. Just a few days prior I’d spotted a massive, sleek Cooper’s Hawk scoping out a neighbor’s birdfeeder. I put my binoculars on the source of the call, a small bird hammering at a pinecone far above my head. 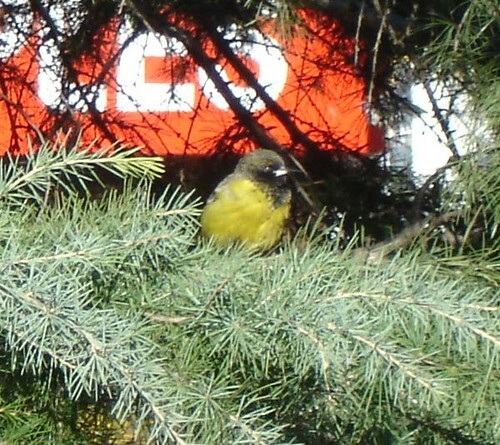 At first, I could only make out a slate back – but the profile seemed wrong for a Titmouse or Chickadee. And then it turned. And as if someone had written the story, the brown head and white nape spot became obvious. Another bird, younger, without the nape spot, joined the first. And then a third appeared. I stared as long as my wrists would let me, then handed the binoculars to the Inimitable Todd. Eventually the flock moved on, taking with it what was most likely my last life bird of the decade. A bird that appeared, even in this inauspicious place, determined to survive. As I walked up Park Avenue I spotted a Rock Pigeon chick, about ten days old, lying stiffly dead on the steps of a church. At that age, they are bristly and their underlying structure is apparent; you can see how they were related to the Dodo. At first I felt a visceral wrongness at seeing a baby bird in the heart of December, but Rock Pigeons will breed whenever the food supply is adequate, and in the city it always is. With pigeons so prolific and natural selection so unremitting, that means there must be a lot of dead baby pigeons in the city at any given time. And even given that most dead baby pigeons will be eaten by scavengers before long, and that many may fall in out-of-the-way places, you’d think many would fall within the purview of human observation. And this is true. I can confirm it. I have seen them before now – under overpasses, on fire escapes, and yes, right smack dab on the sidewalk. It’s not like I have magical access to a secret New York where no other human foot treads (I wish!) What I have seen, others can see for themselves. So whence the persistent urban legend that baby pigeons are invisible or perhaps don’t exist? Sure, if all goes well for a pigeon, you’re not going to see it in the street until it’s grown, but as we just pointed out things do not always goes well for pigeons. My hypothesis is this – many, many people do not see dead birds. That is, light bounces off of dead birds and enters people’s eyes, but somewhere in their brains, the dead birds are not acknowledged. I attribute this to a combination of factors. Dead birds are distressing, and people are often unsure of what they mean. They don’t know whether to think about West Nile virus (scary!) or mortality in general or hawks or pollution or what. So their eyes slide over it and they – they don’t forget, so much as never construct a memory about it at all. I theorize that this happens for other dead birds besides just pigeons. This autumn, I found an indeterminate (squished) warbler on the sidewalk of Park Avenue; a pristine Red-winged Blackbird in a pocket park not far from the Battery; birds that surely, if nothing else, a person who was really thinking would have moved aside from the path of traffic out of respect, but no one had. That’s what I like about this. Indeed, I’d like to see it expanded, formalized, and similar books created for other cities as well. Pick the top, say, twenty-five birds that impact with windows in any given metropolitan area. Streamline the descriptions – I like the combination of detail about the bird in life and reminders that the bird is dead, and why, but it could be fine-tuned. Include some back-matter on the proper method of reviving the stunned bird, getting the dead bird to the nearest museum, and information on preventing window strikes in the first place. Figure out a way to distribute them at low or no cost not just to people who are already interested in birds, but landlords and early-morning dog walkers, buyers and renters of condominiums, groundskeepers, joggers. Hell – we should make a series of posters, stick them to offending windows! We should create stencils and give them to young punks and those hipsters who whitewash over the illegal ads. We should put cards in the tea tins; build little memorials where we find birds, with candles and flowers. Notice, notice, notice, and explain. Give people a way to see dead birds, and they won’t be invisible any more. Recently, over at 10000 Birds, Charlie touched on the controversial subject of killing introduced and invasive species. This is a conservation strategy that raises ethical concerns on the individual and population level, and often involves unexpected wrinkles, as when the invaders turns out to be threatened themselves. On the other hand, it has also saved some species that might otherwise have been lost forever. Another problem is that “invasive” and “introduced”, though highly overlapping concepts, are not perfectly congruent. While “people did it” vs. “it’s natural” is, at heart, a false dichotomy, removing animals that were directly placed in a new region by human activity – released pets, stowaway snakes, etc. – tends to be viewed in the lens of correcting an error or setting right what once went wrong. “Natural” range expansions carried out by animals mainly under their own steam, however, are often welcomed or celebrated – even when humans have significantly contributed with assists in the form of new habitat, food sources, etc. (See Northern Cardinal and Cattle Egret). It’s an emotional reaction, but not necessarily a wrong one – after all, expanding to take advantage of a changed environment is a time-honored evolutionary tactic, and if there’s one thing that can’t be denied, it’s that humans are changing the environment. Attempting to set in stone a certain range as forever correct for a species would be equally artificial. In light of all this, federal biologists are considering an action that has unfortunate echoes of the old-school: controlling (that is, killing) Barred Owls in areas where they come into conflict with the Spotted. The Spotted Owl is rare and precious; the Barred Owl is common and disposable. Or, the Barred Owl is vigorous and successful; the Spotted Owl is feeble and too picky for the new environment in which it finds itself, so an evolutionary failure. Neither set of value judgments tells the truth about either species, or gives us a simple right answer on what to think about these measures. I don’t know what is right, but I do know what is wrong – the constraints within which the Fish and Wildlife Service has been driven to consider this desperate measure. Because there’s another party to the Spotted Owl’s destruction – one that we all know very well: habitat destruction. Controlling barred owls was a central strategy of the Bush administration’s overhaul of the spotted owl recovery plan to make way for more logging. The insane, unsustainable management strategies of the timber industry have held the Spotted Owls hostage for a long time, and now they are using the Barred Owl as a scapegoat in a vague parallel to the way they once used their own underpaid and exploited employees in the same role: someone’s going to get the shaft, but you can bet it won’t be timber company executives. “Let’s you and him fight” is their favorite game. So this I know: if the choice is between less logging in the old-growth forests and killing damn near any species at all, it’s definitely the timber industry’s turn to take the hit. And the timber industry’s role to make good the loss to their employees that’s bound to occur, not because tree-huggers are so darn unreasonable, but because they themselves have chosen to enact a tragedy of the commons and force a situation of sudden decline rather than opt for slower growth and a sustainable business model. After all, these same people would be abruptly out of work should all the big, old trees go for pulp rather than into a preserve. It’s not everyone else’s job to keep them in business by giving up our natural heritage, our public lands, and in the case of the Barred Owls, our life’s blood. I have to admit, I identify with the Ash-throated Flycatcher. Much like myself, many individuals of this species apparently have a terrible sense of direction – they leave Texas or California (reliably indicated by Woody Guthrie to be “the Garden of Eden/ a paradise to live in or to see”) and instead of ending up at their traditional wintering grounds, they end up…. well, in Queens. Which is why I ended up in Queens. I wasn’t lost, though. In fact, this bird rivaled the Union Square Scott’s Oriole for proximity to a subway stop. Only the subway stop was not in Union Square, surrounded by coffee shops and boutiques and the bustle of the farmer’s market. It was… well, in Queens. Nevertheless, after Sunday dawned all innocent of the split-personality precipitation that forced me to spend Saturday in a series of bookstores and bars (a terrible burden), I got on the A train and traveled out to the strange netherworld where a confused Ash-throated Flycatcher had lingered for some two weeks. It was brisk but cold, and the subway in this remote, benighted land ran above the ground, if you can imagine that. I left the station, rounded a corner, and peered into a vacant lot where the bird had been wont to linger. Yes, the Ash-throated Flycatcher had put in an appearance, and I’d missed it! Would this be Western M(*^*(^^&^$%#% Reef-heron Part Deux? We scanned the backyards full of hedges and bittersweet. I wondered if anyone was going to call the cops. We turned around and scanned the shrubbery around the elevated train line. I wondered if anyone was going to call Homeland Security. We spotted House Sparrows, Robins, Mockingbirds. A Song Sparrow, a White-throated Sparrow, a female Cardinal. A good variety of common, typical, not the least bit lost birds. The only official-type person who ever did ask us our business was an off-duty bus driver who pulled over, curious about what he’d been seeing people staring at all week. We explained it to him as best we could. He seemed duly impressed. But as time went by and the bird didn’t show, I was feeling less and less impressed myself. I could have gone to Jamaica Bay, I thought, and looked for the Red-necked Grebe; I could have gone to Central Park and looked for owls; I could have gone to Staten Island and looked for the Rufus Hummingbird. But no. Here I was, staring at trees and Robins and various sparrows…. Suddenly a Mockingbird flashed across the corner of my vision; only it wasn’t a Mockingbird, too small, proportioned wrong, and most of all, too green and brown for a gray and black bird. The Ash-throated Flycatcher landed just long enough for my to register it, then ducked behind a convenient shed. But soon it was back again, showing off not just for me but for two other birders that I was able to get on to it. It flitted from weed to weed, apparently resorting to seeds in lieu of flies. The traditional description of the Ash-throated Flycatcher is a smaller, washed-out Great Crested Flycatcher. But this hardly does justice to a bird with a pearl-gray throat, a bright rufus wing-patch and tail, and a belly the color of the lemon cream in a Whitman’s Sampler. It kept fluffing up its crown while I watched it, a Tyrant Flycatcher to the core, even if it was alone and confused and dearly wishing it had taken that left turn at Albuquerque. Eventually it moved back into the scrub, and I got back on the train for the long trek back to Brooklyn. Scotty: Now an Official Part of the NYS Avifauna! Via The New York Birding List, I am delighted to learn the New York State Avian Records Committee has officially accepted the 2007-2008 Union Square Scott’s Oriole as a legitimate record, marking the Official One True and Only First State Record of Icterus parisorum for New York. What does this mean, exactly? It means that NYSARC, composed of eight illustrious and experienced New York birders, has gone over all submitted records of Scotty – the photos, the written descriptions, any recordings that were made – and determined that he A.) is an actual, honest-to-goodness Scott’s Oriole and B.) can be reasonably believed to have gotten to Union Square under his own power, rather than escaping from captivity. Since 1977, the committee has used this two-pronged criteria to determine which birds are and are not recognized rarities in New York State. Sometimes it can get quite complicated, with discussions of hypothetical hybrids and tail-feather wear from cages spanning years. The result, after the votes are counted, is the official list of birds known to occur in New York. The committee also accepted four other new additions to the state list for 2007/2008 – the Western M(*^$^&^%&^^ing Reef-heron, Pink-footed Goose, Cassin’s Kingbird, and Yellow/Eastern Yellow Wagtail. This brings New York’s list to 475. If it seems like I’ve been waiting eagerly for this day, I have. Things don’t always work out so happily for listers and the megararities they cherish.